What is going on in tech these days and why is it important? If you read the post "Chart of the Day: Looking for Sector Leadership" at the Vix and More blog, you can see from the chart that tech is not the leading sector in the current rally (there are several sectors doing better) but but it has been performing decently. To see the rally continue, however, investors would like to see tech step up and assume more of a leadership role as it usually does when stocks break out to new highs. Something is holding tech back. 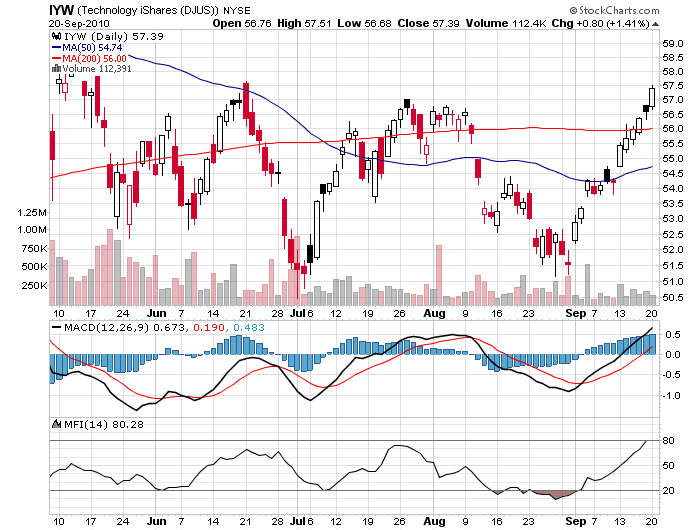 Let’s look at three tech-focused ETFs and see graphically what is happening. 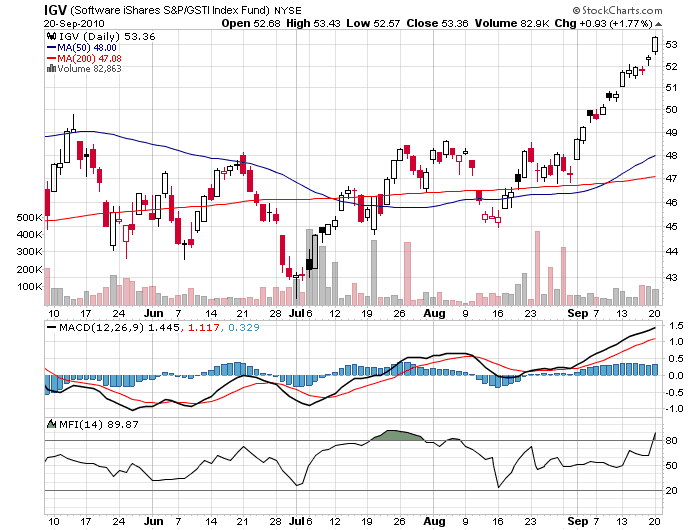 The first is the iShares Dow Jones Technology Index ETF ($IYW). You can see a beautiful breakout above the 200-DMA and the 50-DMA. 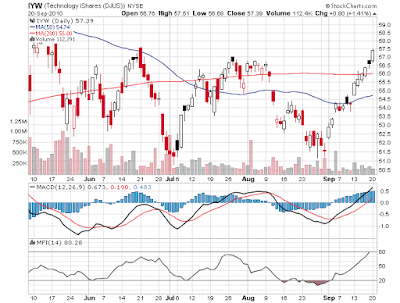 Indeed, the 50-DMA is now trending upward. The next one is the iShares S&P North American Tech-Software ($IGV). 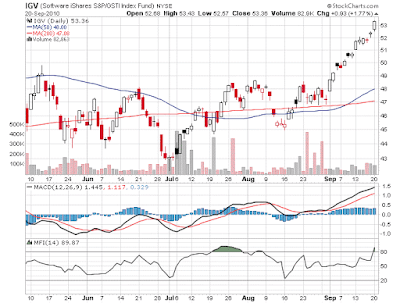 This ETF is in a full-fledged, all-out bullish trend. 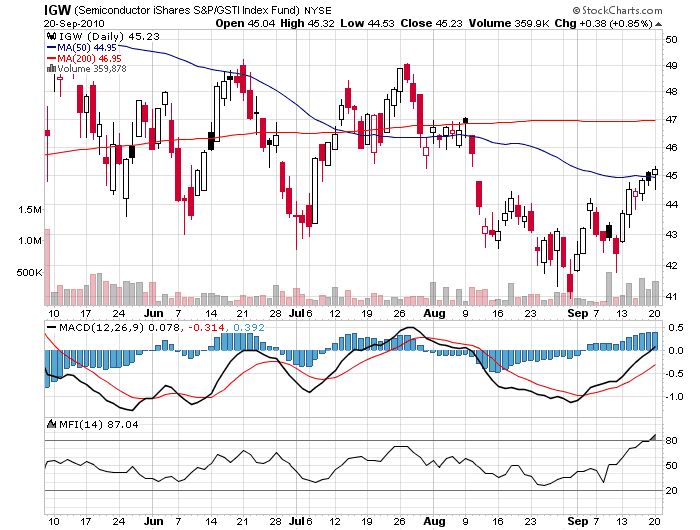 Finally we have the iShares S&P/GSTI Semiconductor ETF ($IGW). This ETF is noticeably lagging the other tech ETFs. And no wonder, with Intel reducing guidance a month after their earnings report, analysts from JP Morgan and other institutions pointing to slowdowns in the supply chains for PCs and flat-screen TVs, Texas Instruments giving lackluster guidance recently, Samsung's CEO saying today that LCD and chip profits have hit a peak, reports from Taiwan that PC component sales are slowing and fab capacity is increasing, etc. This chart is certainly showing improvement but where the other charts are showing clear signs of a breakout, this chart looks like it's just getting started. Some might ask whether the reversal in semiconductors is even real given that the ETF struggled for three days just to break above its 50-DMA. Can tech outperform without the semiconductors? The following is a list of all the industries that are considered part of the tech sector according to data I gathered from the NASDAQ web site. There are a total of 17 industries in the list. Note that Advertising includes at least some companies that are primarily involved in online advertising. These companies usually maintain large server farms from which ads are served and tracked and, hence, can be considered to have semiconductors somewhere in their supply chain. So here’s the quandary: It is understandable why the software companies are doing well, especially after an excellent earnings report from Oracle last week. Indeed, Gartner just released a report indicating that worldwide enterprise software revenue is on pace to surpass $232 billion in 2010, a 4.5 percent increase from 2009 revenue of $222.4 billion. No double-dip in the software industry, apparently. Though sales are expected to be most robust in the Asia/Pacific region, enterprise software spending in North America is forecast to reach $110.8 billion in 2010, an 8.5 percent increase from 2009 revenue of $102.1 billion. Gartner says the market will experience consistent growth through 2014. But what about all those other tech companies? Pretty much all hardware companies use semiconductors in their products. It seems reasonable to say, therefore, that companies involved in manufacturing hardware or companies that are heavily dependent on using technology products should, by extension, feed demand for semiconductors. 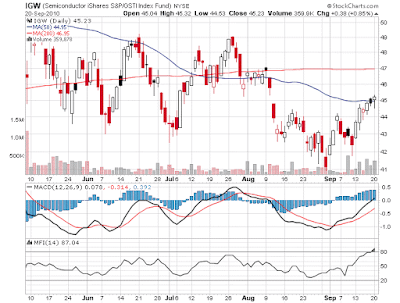 But the charts seem to show that investors don’t expect that semiconductor demand to materialize. Tech stocks have gotten ahead of themselves and the poor performance of the semiconductors suggests a pullback is overdue. Is some of the rise in tech stocks due to the buyout mania currently sweeping the industry? It is instructive to note that of the recent acquisitions by IBM, Cisco, HP and Intel only one of them acquired a semiconductor company and that is Intel when they bought the RF chip business of Infineon. Even Intel went for a software company when they acquired McAfee. This week we will see the Durable Goods report for August so we'll get some better insight on the state of the hardware manufacturers (semiconductors are no longer broken out separately). And so, back to the original question: can the market put on a substantial rally without tech? Probably not but it seems the market can definitely rally without the semiconductors, at least for a while. Nevertheless, I have to consider the lack of participation by the semiconductors to be a warning sign, even as I enjoy the rally.